If I could sit down and have a cup of coffee with her, or with you, or if you were a part of my local MOPS group and we were talking about real life in one of the discussion groups, then this is what I would tell you. Like, hardest thing you’ve ever done in your entire life kind of hard. One of my friends, a fellow teacher, said it best after she gave birth to her first child. She said something along the lines of this: “We’re capable women. We’ve had these careers, we can manage a classroom full of teenagers, and we can earn our master’s degrees. Yet sometimes, we just can’t get the baby to stop crying.” Yeah, I know that feeling. Motherhood is pretty stinkin’ hard. I remember taking calculus. That was hard. I remember juggling graduate school and teaching high school full time while helping out with the youth group at church. And that was so hard. And I remember learning to ski for the first time. I was mad at the instructor for his lack of patience with the southerners in the group and I just couldn’t get it. I felt like I never would. And then I did. And I made a pizza, snowplow, whatever you want to call it with my skis and I slowly skied down that mountain. And I got it. But motherhood? You don’t really get it. You never arrive and master it. You can hit your stride, gain some confidence, and learn how to focus on the important stuff, walking in obedience to the Lord and serving your children. But it’s still going to be exhausting and draining at times. And kids are always changing, so you have to adapt as you move along. Seasons of motherhood change and we have to respond to the ebb and flow, the hills and valleys. And then there are the heartbreaks of motherhood. Disobedience from children. Losing patience with them again. Wondering Will they know the Lord? Will they walk away for a time or forever? I always think that we moms of little ones have it hard, but then I see my friends who are older and they struggle with different things. Their children can choose for themselves and maybe those choices aren’t quite what mom would want them to be. And all they can do is pray. That’s hard stuff. There are the scary situations, like sending your baby to the operating room with no idea if he’ll come out OK, much less ever be “normal”–whatever that is. I remember an anesthesiologist sitting me down so that I could sign away my permission for lung surgery for my baby boy. She said, dramatically “Your baby could die in surgery.” And I cried, but what choice did I have? Surgery could go wrong and he wouldn’t make it, but without it, he had no chance. And he’s normal now, but I had no idea that it would turn out this way. Parenting is full of blind curves. Parenting means making tough decisions on all the minutiae. Before I had kids, I thought everything was cut and dry, black and white, like balancing equations in chemistry or an algebra problem. Input x and your output will be y. Introduce solids at this age and breastfeed until this age, and you’re guaranteed to have healthy children, free of all food allergies. Too bad that’s not real life. Or at least it’s not my life. And today’s moms are bombarded by information and we have to figure out what to do with it. Suddenly, the type of container your food is stored in matters, as does the tooth paste you give your kids. It’s enough of a challenge to make healthy meals without Pinterest telling you that it has to be cute too and Instagram-worthy. And let’s not even talk about mommy wars and vaccinations and other fun stuff like that. We get to make these decisions and then suffer the consequences in our social circles if we don’t measure up to their standards of being a good mommy. I’m so over the mommy wars. Yes, motherhood is hard. I have heard the baby cry at 5 am, and groaned at the mere thought of nursing him again because I saw every. single. hour. on that clock last night. And a toddler would be up at 7:30, ready for breakfast and playtime. Completely exhausted, yet I wouldn’t have it any other way. It grows me, challenges me, and pushes me to be more like Christ. With every baby, more “waste” is cut back in my life. The stuff that doesn’t honor God has to be tossed out or I’ll never survive this crazy hard life that is exactly what I want it to be. Motherhood offers a chance for us to see things through their eyes, the opportunity to teach our children and cultivate their precious little hearts. Motherhood is full of joy. Don’t miss it, mama. Don’t let the hard stuff eclipse the joy. Often, there are only about thirty seconds between the two. Motherhood is full of snuggles, belly laughs, and that smell. That baby smell they have. There’s the one year old who wears a stethoscope on his head and declares it to be a hat. The two year old who puts his chubby arms around my neck and says “I’m looooove you, Mommy.” The five year old who announces that she can’t wait to be a mommy one day too. I can’t wait either, baby girl, but let’s slow down a little. I want to enjoy you–your games, your laughter, your flair for the dramatic and your love for all things pink and sparkly. I’m sure she thinks motherhood is easy. I won’t tell her differently if you won’t. What about you? Is motherhood easy or hard for you? What a great post! Yes. It IS hard. I once wrote a post about how raising twins is hard (because, well, it is!!). But, even with one, motherhood is the first (okay second after marriage) when you realize you are NOT in control. Despite your best efforts at times, kids have their own wills and their own personalities and you cannot control everything, like you can a job or other responsibilities that aren’t 24/7 and involve little people. But, BOY, do I love being a mom! Absolutely! There’s nothing better. I am sure that twins are SO hard–I am one! You are right–kids are all so different! If they had no personality variations, then motherhood would be super easy and not nearly as much fun. Just when I thought I had the knack of it – the next child would require me to mix it up, develop new solutions for different challenges. I’m still learning the teen thing – the teen gig is much harder for me. Little ones forgive and forget. Teens never forget:) Love the encouragement in your post. Love your heart! Thank you! Yes, that is how I feel too! Just when I figure them out, someone starts walking, potty training, homeschooling, or a new baby comes along and we’re back to the drawing board again! Ooo, I am sure teens are TOUGH. LOVED this post and TOTALLY agree!!!! We do a disservice to other moms when we pretend life is easy, don’t we? Oh, Gabby! You did wonderful with saying what every mother thinks (well, I guess every mother…maybe I should say me). 🙂 Yes, it’s hard, and I think for me it’s the decisions! It seems that whatever decision I make for my children, there’s some “expert” out there to negate it, which in turn stirs doubt. Whatever we decide is best for our little ones, it seems we have to be ready with an answer to defend our reasons. It’s so frustrating! What I love, are my friends & mentors who point me back to the word of God as my measuring stick to remind me that it’s his opinion that matters most. Thanks for writing this! Thank you! Yes it’s much easier if we mother for an audience of ONE instead of trying to please those around us, isn’t it? But I tend to want approval from others, and that’s a great way to stop pleasing God. 🙂 Thank you for the encouragement, Erica! I LOVE this post. My favorite part, though, was the line: “With every baby, more “waste” is cut back in my life.” Except that I didn’t think of spiritual waste, but just all the extra “stuff” that takes up so much time. Even good stuff. Anyways, thanks for the encouragement! Thank you, Brittany! We do have to be intentional with pruning our schedules even as God is pruning our hearts. I love this. You really have a way with words! Beautiful Post! Motherhood has been hard for me as well, but I agree that it is best thing that I’ve ever done! Well said. 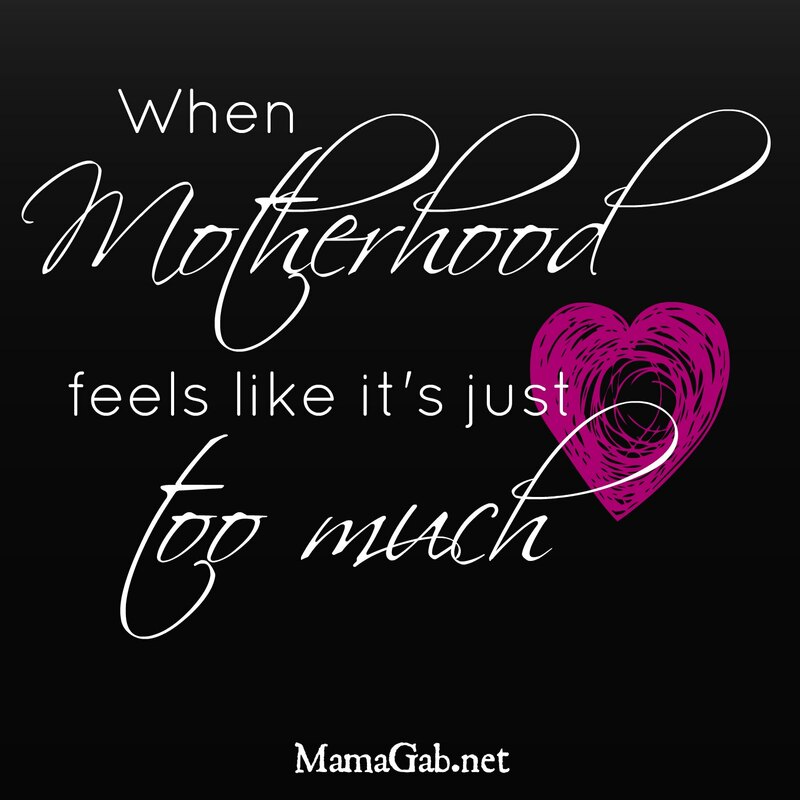 Motherhood can be extremely, unbelievably hard, so hard it breaks your heart. Or it can be so wonderful that it breaks your heart all over again just to see how much you love your children. I’m so glad to read your story and about your love to your children. Thank you for sharing! Great post! I had grand plans before my son was born, and well, God had different ones. 😉 But the sacrifices are SO worth having my precious little guy. Children are a blessing from the Lord. Janelle @ The Smudge Curve recently posted…Don’t Ring That Doorbell! I love love love love love this post and have to share it! I found you via the Sits link up. This post speaks so much to my heart. My little boy just turned 3. We are only 3 weeks into 3 and it’s so much harder than 2 ever was! Motherhood is the most exhausting, hard, and scary experience as you mold this little person, but it is also the most rewarding, amazing, joyful experience! Your post resonates with me! Three really IS hard, or at least it was with my oldest. I agree, it’s far more rewarding than I’d even imagined. Rachael DeBruin recently posted…No More Excuses! I’m so glad you shared this with me! Thank you so much! Thanks so much, Amanda. Your post today struck a chord with me. We need to remember to encourage with our words.